CCC is the leader in turbomachinery train optimization services for upstream, midstream and downstream operators. The new Saudi Arabia facility will further expand CCC’s staff and bolster its local capabilities in a thriving region for the upstream and downstream oil & gas industries. CCC (Compressor Controls Corporation) the leader in Turbomachinery Train Optimization Services for upstream, midstream and downstream operators today announced that it has opened a new Sales and Service facility in Al-Khobar, Saudi Arabia. This new facility highlights CCC’s commitment to servicing existing customers in Saudi Arabia, and bolsters CCC’s ability to service new projects throughout the region. 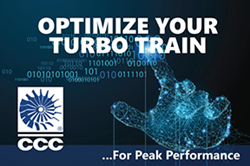 CCC’s Turbo Train Optimization Services enable oil & gas and petrochemical operators to optimize efficiency, enhance yield and improve the safety & security of processes that use Turbomachinery. CCC’s local consultants collaborate with plant operators as well as process, machinery & maintenance engineers to optimize the design and tuning of turbomachinery control systems to maximize plant yield and minimize energy consumption. “CCC’s optimization capabilities rely on a time-tested and proven combination of hardware, software and professional services, delivered by local experts that can immerse themselves in a customer’s operations,” said CCC’s Islam Fahmi. “This new office expands our capabilities to help CCC's customers in Saudi Arabia, and it will also enable us to attract new projects throughout the Middle East." For turbomachinery optimization projects, proper design, control strategies and hardware selection can eliminate efficiency constraints at the outset. Even in established plants throughout the Middle East that operate 24x7 (where it is not possible to completely redesign piping and valve architectures), CCC’s experts can still deliver significant gains by implementing control systems with advanced algorithms that improve compressor and turbine operational effectiveness. CCC’s expertise in deploying compressor performance, speed, load-sharing, and anti-surge controls enables plants to expand the operating envelop for equipment - all while optimizing a compressor train’s energy usage. CCC’s analysts & consultants have garnered more than two billion hours of operational experience from tens-of-thousands of machinery control installations around the globe. The new Saudi Arabia facility will further expand CCC’s staff and bolster its local capabilities in this thriving region for the upstream and downstream oil & gas industries. Local customers in the region who would like to see the new facility, located on Floor #3, Unit #1 of the Adeer Tower, at 7383 Prince Turkey Street in Al-Khobar, Saudi Arabia are encouraged to contact their local CCC representative, or saudiarabia@cccglobal.com. CCC is the industry leading turbomachinery optimization company for the upstream, midstream and downstream Oil & Gas industry. Since 1974, more than 37,000 installations have benefitted from more than two billion hours of CCC’s operational experience. This expertise is codified in a comprehensive platform of hardware, software and consulting services that optimize turbomachinery to improve processes, increase yield, save energy, reduce downtime and enhance plant safety & security. CCC’s optimization platform is technology-agnostic, and CCCs local experts deliver field-proven solutions anywhere around the globe. For more information, please visit: https://www.cccglobal.com.